These list of devices will make your home smarter. For example, if you want to turn the heating on you can use the thermostat. Play music by talking with the device or keeping an eye on your property when you not even their. 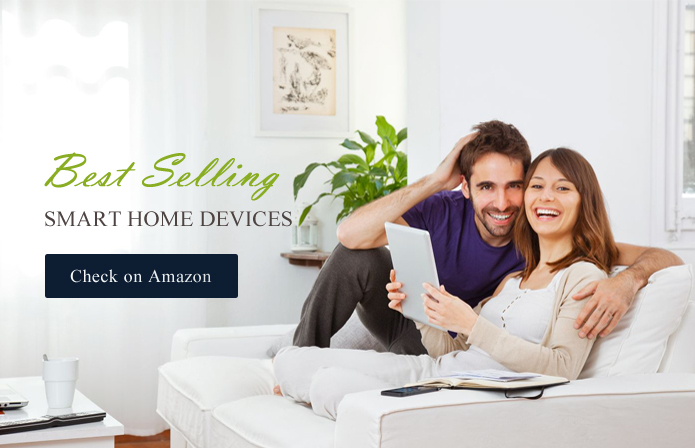 There are many smart home devices available on the market. But we shortlisted the bestselling product from each different category. Amazon Echo Dot is a small yet powerful version of Amazon Echo. It’s a voice-controlled smart home device. You ask the device to play music for you, control other smart devices, read audio books, provide information and lots of other things can be managed with this amazing this device. There is a little problem with this device that is the sound of this device isn’t loud enough. So Go for it if you don’t have any problem with sound. Nest Cam Indoor security camera is 130° wide-angle day and night camera. It’s the security camera available for your smart home. Except for security, you can also use the speaker to be connected to your pet. As far as the design concern it’s looks so sleek and cool. Sometimes the camera gets too hot. And there is no recording storage and you have to pay the monthly subscription fee to get the full feature of the device. Now you can control your door with a Smartphone. Using August Smart Lock you can grant or restrict visitor anytime. It also keeps track of 24/7 activity log. It takes just 15-20 minutes to install the smart lock. And easy to set up with iPhone, iWatch and Apple HomeKit. If your door isn’t perfectly aligned then the lock will fail. And the battery life of this product isn’t good enough. So make sure before you buy it. Philips Hue is a smartphone-controlled smart lighting system. You can set schedules for lights. Works perfectly with Phillips hub. A super simple installation process will give you a brighter lighting experience in your home. Remember, you need a hub to interface with the Echo Dot. Logitech Remote Control is a one-stop remote control device for your other smart home device such as lights, locks, thermostats, sensors. A rock-solid wifi connection needed to run this device smoothly. This device has a limit of 15 devices that can be controlled using this device. You need to be tech savvy to install it properly. Nest Thermostat is the best and smart temperature control solution for your home. This device can be controlled using the smartphone. It also works perfectly with Google Home or Amazon Echo. This amazing device also helps to save energy. It took just 20 minutes approx to install. If your home has two floors then it’s not recommended to use the device because it may become ineffective. So these are the list of 2017 bestselling smart devices for Home. We think these will also rock in 2018 as well. Let us know your favorite one if it’s didn’t listed via comment.